The Associated Press reported Monday that security was increased this week at schools throughout the United States following a shooting last Friday that left 26 students and staff dead at Sandy Hook Elementary School in Newtown, Ct. The Blaine County School District was no exception. Barber’s statement was confirmed by Hailey Police Chief Jeff Gunter, whose agency provides police services for the majority of the district’s schools and facilities. Law enforcement agencies in Blaine County have been training for school shootings or situations in other buildings or facilities where violence is occurring or threatened. Most recently, in October, police throughout the valley participated in an emergency drill with a mock shooter at St. Luke’s Wood River. 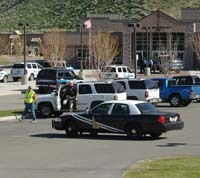 Previously, police have held emergency drills at other facilities including schools. “We’re trained to go into any place, any building,” Gunter said. “It’s not a task force, it’s everybody. We have actively trained our patrol officers in active shooting scenarios. If something like that happened here, we are prepared and we would go in and get the shooter. The preparation involves not only Hailey police but all police agencies in the county. Ramsey and Gunter said the top police priority in a shooting rampage in any building is to get the shooter or shooters first. “We will respond and not make the same mistakes they made in the past, like at Columbine where they tried containment,” Ramsey said. The sheriff was referring to shootings at Columbine High School in Littleton, Colo., in 1999, where two students killed 12 of their classmates and a teacher. Later investigation showed that the shooters continued killing students even after police had surrounded the school but hadn’t yet entered the building.